What could be better than the smell of bacon cooking and spiced pumpkin coffee brewin' while your main dish is cooking away in the oven on a cool, rainy morning? Our Deep Dish Mexi Frittata is perfect for such a day and will feed a family ( or group ) of six light eaters easily. If you've got more hearty eaters just double the recipe and bake two! 1/2 cup of homemade salsa ( or your favorite brand salsa in a jar ) Mild or Spicy? You decide! Mix eggs and milk in a large mixing bowl and stir together. Add the remaining ingredients ( except the avocado and bacon ) with a dash of salt and pepper. Sprinkle with red pepper flakes and bake for 30 to 40 minutes. * This dish can also be cooked in a cast iron skillet! Remove from oven and top with avocado chunks and bacon bits. Dollop of sour cream is optional! Serve with fresh fruit, juice, coffee or tea, and steamed tortilla's or toast. Mexi Frittata can be served hot or cold. We like it best right out of the oven! I'm linking up to the fabulous Homestead Barn Hop today! Welcome one and all to week # 76 of the Farmgirl Friday Blog Hop! Your place to do a little brag'n and a whole lot of sharing about all things homemaking and homesteading no matter where your planted and growing! The FARMGIRL FRIDAY Recipe Box! I've pinned 100 of YOUR recipes so far with many more to follow! It's so FULL of FARMGIRL FOOD goodness I've added it to my side bar so more friends can enjoy a taste of home every day! You done yourselves proud sisters! Feel free to create your own link by choosing a photo of any recipe you've entered previously with a link to the FFRB board and add it to your blogs and share it on Facebook too! I'm sharing one Farmgirl Friday Recipe every Thursday here! Don't despair if you don't see your recipes pinned yet... I'm work'n on it! 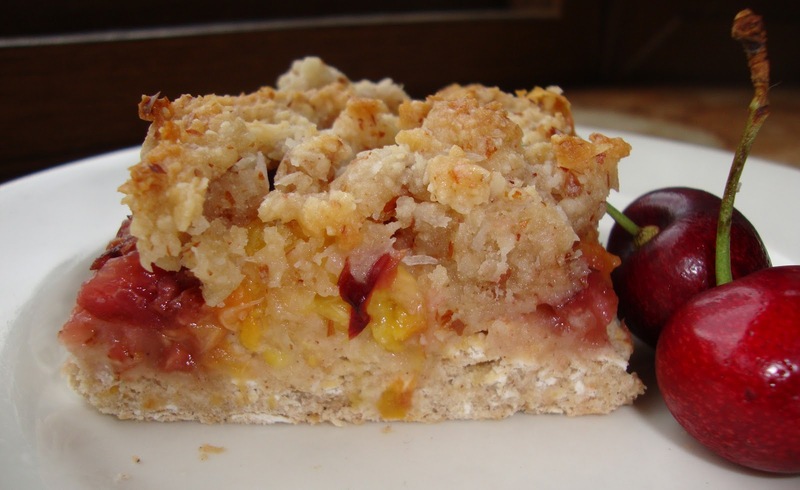 Cherry Peach Bars from Real Food. Real Deals. It's been a joy ( and an honor ) looking back at your entries. In fact, I've been inspired to create two new boards titled: Farmgirl Friday Farmyards and Homesteads and Farmgirl Friday Crafts and Home! So, please keep those wonderful entries coming! You are all winners to me! And now, on with the hop... I've gotta run... For SOME reason I'm starving?! Oh yes! MaryJane has a pinterest board featuring recipes from GirlGabBloggers too! Be sure to check it out.. I've seen some of your FABULOUS home cookin' pins over there too! Now it's your turn! What's happening in your farmgirl world? We want to get to know you better! Have a great week and I'll see you on the hop! PS. Let's gather more farmgirls for our hop! Scroll down and copy the code ( where it says get the code here ) for this hop and place it in your blog post. Now that we've passed the Autumn Equinox the girls and I are ready to begin our fall decorating! 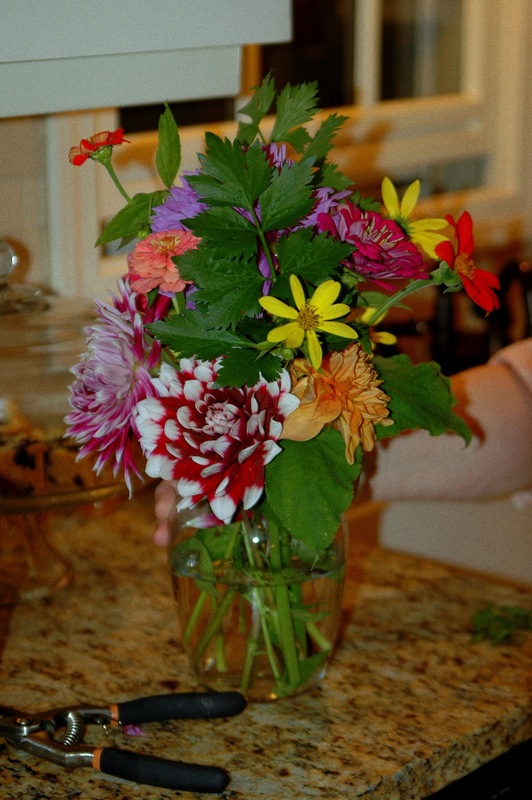 I love having fresh flowers in the house straight from the garden! The change of the seasons is a wonderful time to go out into your yard and gather up some of your late summer bloomers, berries, seed pods and create a fresh, festive and sustainable fall floral arrangement for your dining room table, kitchen island or a friend to celebrate! My blooming pumpkin does just that and it's chicken friendly too! Pick or purchase a pumpkin to your liking. I chose a medium sized pumpkin and cleaned it out setting aside the pumpkin seeds and the lid for the Cottage Hens. Make your opening large enough that a quart mason jar ( or similar sized vase ) will fit inside easily without the top showing after it's filled. 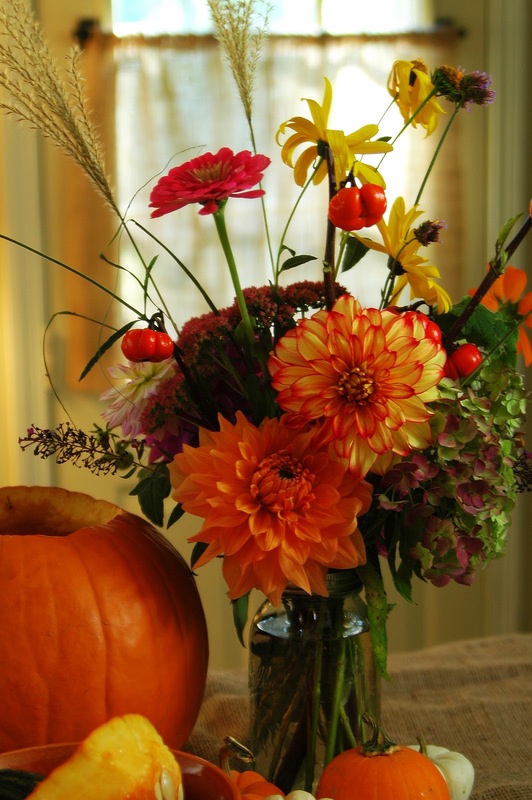 * If you use a smaller pumpkin try the 16 oz mason jars for a vase. This view shows dahlia, hydrangea, butterfly bush, autumn joy, pumpkin on a stick, a sprig of grass and some wild sunflowers. This is the other side of the arrangement. 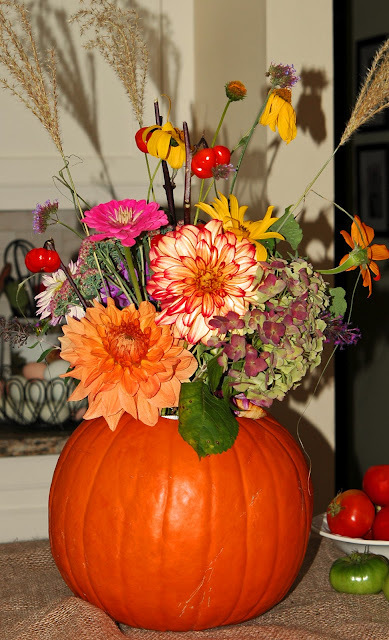 If your pumpkin is going to be placed where it will be visible from all angles be sure to make it pretty from all sides. Because the dahlia and the hydrangea blossoms are so large and I wanted to hide the opening of the top of the pumpkin I cut them shorter and placed them near the bottom.. Taller flowers like the sunflower, grass plumes, zinnia Mexican sun flower and pumpkin on a stick were cut longer at varying lengths for height and fullness. I've placed ours on the kitchen island where we can all enjoy it. It's the first thing we see when we come in the door! Remember, fresh, local blooms aren't fussy about where you put them. 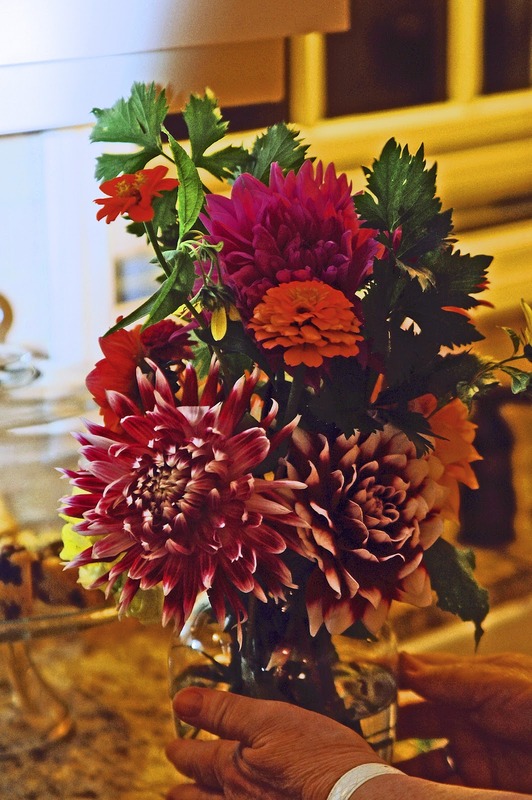 Just relax and have fun with the process of flower arranging. When it looks pleasing to you, you're done! Yard flowers look naturally beautiful together in the garden and they'll be just as delightful in your favorite vase or a bloomin' pumpkin! I'm sharing this post with the Homestead Revival Barn Hop and Heidi's Simple Country Living Garden and Tilly's Nest Down Home Blog Hop! * when your flowers fade, don't forget to toss that pumpkin into your chicken run! Saturday Scenes Returns! Happy Fall! Happy first day of fall friends! Boz Scenes is back to usher is in to this bountiful season. With the delicious sent of fresh autumnal air and a renewed spirit there's nothing we can't do! Welcome to week #75 of the ORIGINAL Farmgirl Friday Blog Hop! I feel like celebrating! 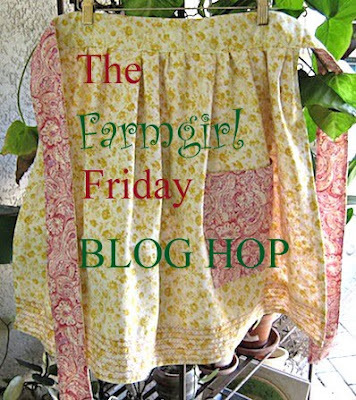 For those of you who are new to the hop or to my blog here's a little back story about how the Farmgirl Friday Blog Hop began in 2011. I wanted to create a place where we bloggers could gather up once a week to share our daily doin's in the kitchen or craft room, hen-house or greenhouse, city balcony or backyard farmyard! And gather we have! Seventy-five weeks sounds like a long time but it sure doesn't feel like it! That's what happens when you're having fun. You're there when a fellow blog sister's bread doesn't rise and when she harvests her first tomato! You prop each other up during new adventures like learning to keep Bees and Chickens or milking your first goat! You share useful and clever home-keeping tips and homemaking wisdom straight from your heart! Pretend with me for a moment? Imagine what an " in person" celebration would be like. Sort of a farmgirl meet and great if you will. I picture us gathered under the shade of a large tree perhaps on a farm, in a pasture or a beautiful garden. Long tables covered in red and white checked table cloths are covered with YOUR delicious Farmgirl Recipes. Since it's almost fall I've set out blooming pumpkins as our centerpiece's. I see smiles everywhere, friendships being made and our tummy's hurt from so much laughter. After all, we're in good company! As the day turns to dusk we exchange addresses, and phone numbers and promise to stay in touch via our blogs and Facebook. Who knows? Maybe one day it will happen! In the mean time I promise to continue hosting every week if you promise to keep dropping by! I can't tell you how much you all inspire me with each and every entry. Thank YOU for making the Farmgirl Friday Blog Hop what it is today. 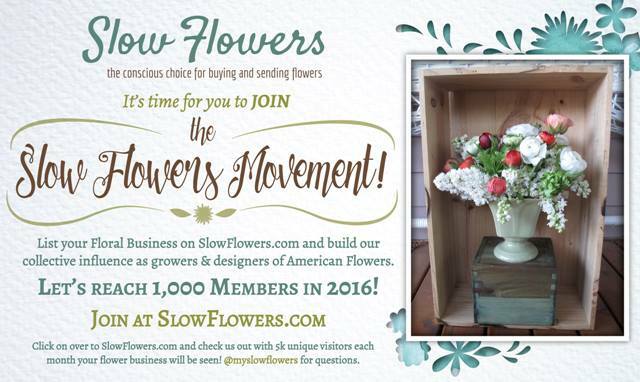 A warm, inspiring and growing community of talented, generous and kind bloggers! I'm blessed to be on the receiving end of all you share here every Friday! I must also mention a very special THANK YOU to my bloggin' farmgirl sis on the West Coast...Heidi ,of My Simple Country Living and White Wolf Farmgirl Blog for co-hosting with me every week! Somehow she manages to post on both of her blogs even when I send her the linky code late at night! We love meeting new blogging friends so don't hold out on us! Link up and play a little farmgirl show and tell right here every Friday! Believe it or not, my cut flower beds are still brimming with blooms! The pumpkin on a stick is ready for cutting for use in flower arrangements and fall decorating. If ever you doubted growing dahlias fugetaboutit... These flowers just keep on blooming day after day from about early July to the first frost ( which we haven't had yet )! I cut this bucket of blooms yesterday! See the cute little orange pumpkin in the top left corner! This farmgirl is still in flower land and that's a good thing. I've started the first chapter of my book " Yard Flowers" It's going to be a lot of work but in the end I hope it will be an inspiration to budding flower lovers everywhere. The joys of nesting have come home to roost here at Dandelion House! Last night while listening to the wind howl ( the prelude to an all night rain storm ) I put the petal to the metal on my grandmothers sewing machine and whipped up a cozy kitchen door window treatment. After removing the tired, dirty old mini blind I gave the door a fresh coat of paint to match the walls and got to work. I made a valance with some left over fabric from our dining room curtains and a cute little burlap cafe curtain for the bottom half of the window. 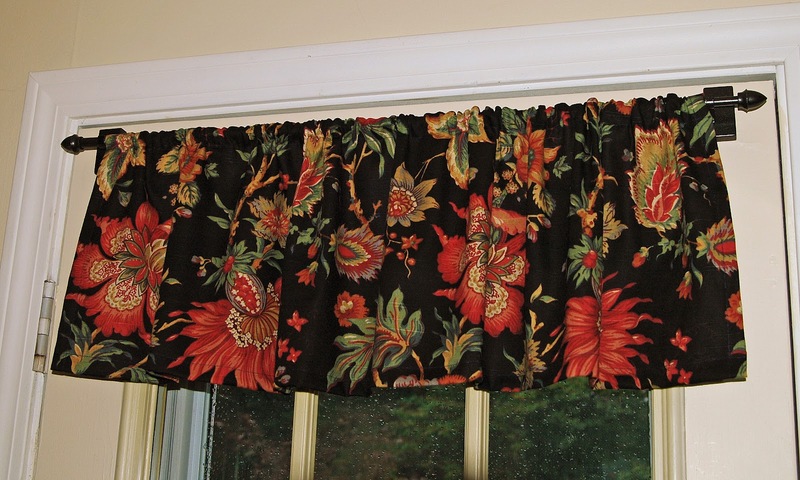 It's easy to make a simple valance and cafe curtain without a pattern with basic sewing skills. 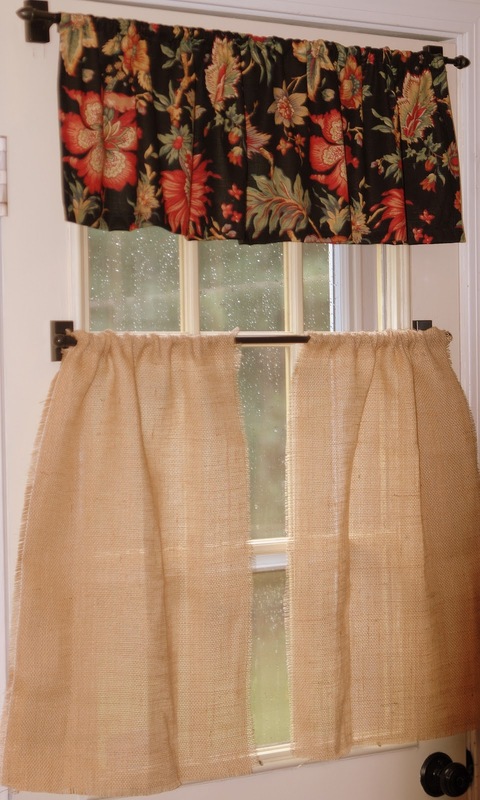 measure the length you would like it to " drop " from the curtain rod and add three inches. this valance has a finished 11 inch drop. measure the width of your window and x it by two. This will be your fabric width. measure the length from top to bottom adding two inches for a rod pocket and another inch all around for hemming the sides and bottom if you are not using burlap and leaving the edges fringed like I did here. 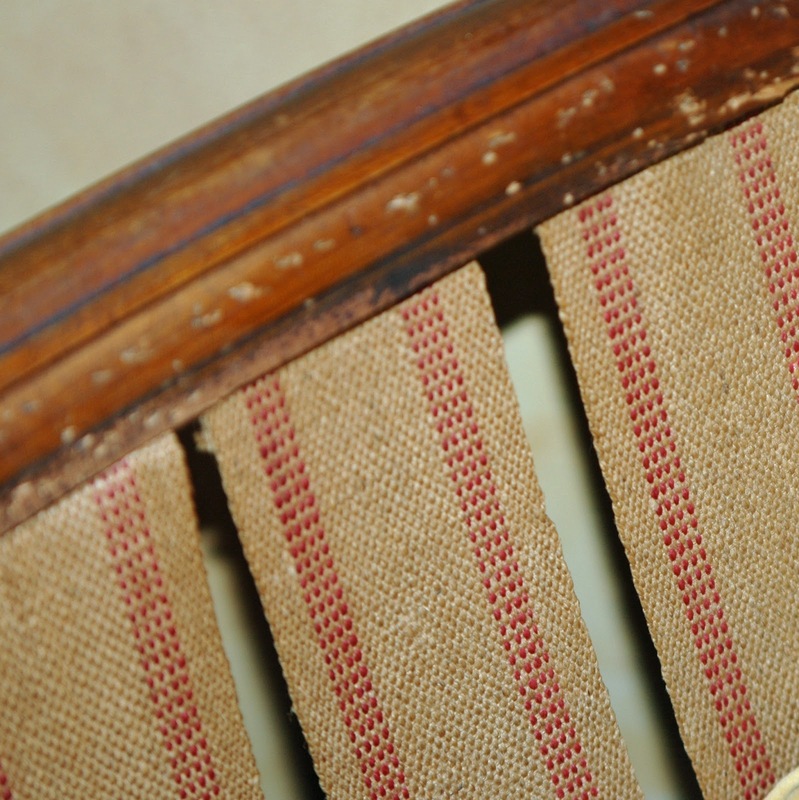 I sewed a rod pocket on the top of the burlap and left the sides and bottom fringed. The burlap let's the natural light in but also provides a bit of privacy. Here it is all together... I love how it cozies up our kitchen but our daughter says it looks like I hung a potato sack on our side door which is just the look I was going for without actually using a potato sack. I guess that makes us both right! What are you sewing right now? I'm sharing my kitchen door swag with Heidi's Homemaker Hop ,Tilly's Nest Down Home Hop # 3 and the Homestead Revival Barn Hop! Go visit them all for more homemaking/homesteading inspiration! 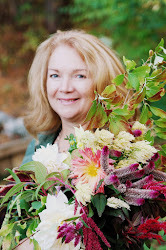 Welcome to the Fall Finery Farmgirl Friday blog hop # 74! Here's where YOU get to show off your best FALL fix ups, food and finery throughout the fall season. And, that means me too! I've got a fun project in the works that involves paint and printed burlap but you'll have to wait until next week for my first fall fix- up! 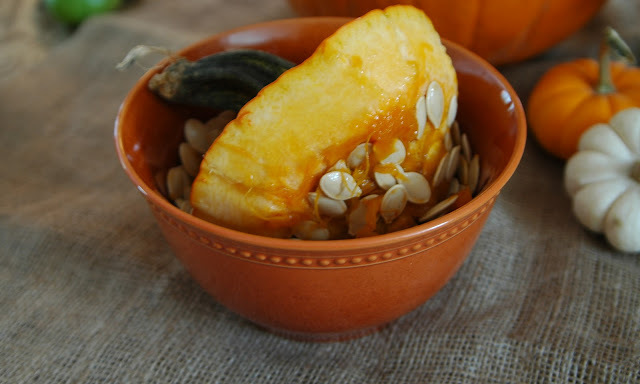 I haven't done a darn thing to get ready for fall outside other than pick up a few mini pumpkins at my favorite local farm stand this week but, I did try another deliciousness Farmgirl Friday recipe from last weeks hop! I love Mexican food so when I saw this I had to try it! This weeks Featured Farmgirl is A Kansas Farm Mom for sharing her Pork Chalupas recipe! Kansas Farm Mom gave three different options for cooking it and using the crock pot was one of them. I really rely on my crock-pot for busy days and this fit the bill for last week where it was the first full week back to school. Prep time was minimal and it was a HUGE hit with the whole family!
" you can make this anytime mom " and I will! How many of you are using our blog hop recipe linkups as a weekly menu planner or inspiration for trying a new home-cooked meal or tasty dessert? Over the last several months it has become my go-to resource for trying new things in the kitchen... I've still yet to bake my own bread but I know if I scroll back into previous hops I'll be able to find plenty to choose from to get me started! That way, we can share them and have access to them all in one place! Let's get hopping... I'm hungry and I'm anxious to see what fab fall things you've been up to! Thanks to everyone for your amazing entries! 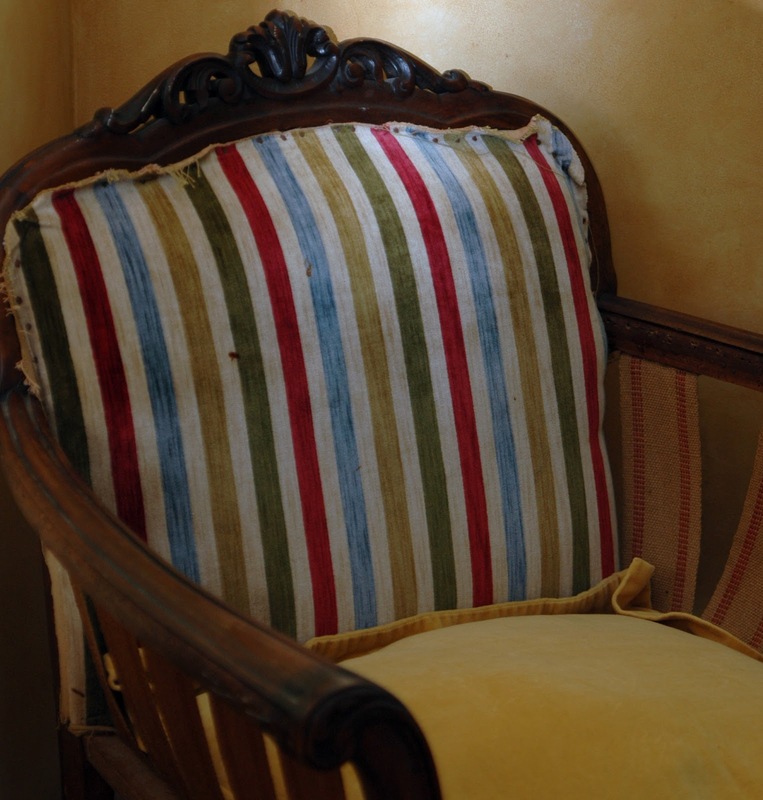 This is exactly how I found it eight years ago at the yard sale where I bought it for $35.00( minus the pillow in the seat) I actually sit in this chair if I'm having a private phone call. Based on today's decorating trend of torn and tortured it doesn't even need any love because this look is all the rage. I'm seeing chairs like this in design magazines and blogs everywhere. But, I digress... So Lucy comes in and says, " hey, why don't you bring that chair down into the dining room where you can keep your eyes on it and maybe you'll get inspired for how you'd like to recover it. " "Sounds good to me" I say, and off I go to try and bring this chair downstairs all by myself. What was I thinking? Things were going fine until I hit the third stair from the top. My plan was to position it on its side and slide it down the stairs without having to lift it over my head and carry it down. Sounds simple enough. Then one leg got stuck under the banister and the top of the chair got wedged against the wall preventing any movement what so ever. Meanwhile, time's a ticking and I still need to shower and change to be on time for dinner. Not only am I a sweaty mess from trying to wriggle and pry my chair free from the stairway, but I had just come in from mowing the the lawn so I had grass stuck to my legs! There's no way I could climb over ( believe me I tried ) the chair to get to our only bathroom with a shower and my closet so I could get ready. That's when I realized I was having a LUCY MOMENT! I had to meet my hubby in 45 minutes for a 6:00 dinner reservation! I called our daughter who was walking home from the bus stop and she came running to my rescue. After she scolded me for trying to move the chair by myself she slid through an opening between the chair and the wall to get upstairs so she could fetch me a washcloth, towel , shampoo and my outfit.! Leaving the chair dilemma behind me temporarily I got ready for my date ' camp style ' in our half bath down stairs. Romantic, I know. I don't have a photo to show you of it stuck because I was in a rush remember... But, you can bet I was thinking about it the whole time! I made it on time and we had a lovely dinner together. We caught up on our day. He told me about the massage he just had and how it really relieved the stiffness in his upper back and then I told him that Lucy Ricardo came to visit...Uh huh. When we got home my hubby had to remove the banister to get the chair UN stuck then he promptly carried it back to the bedroom where it sits today. Oh well, at least I got the cobwebs vacuumed up underneath it! Nesting season is in full swing sisters and Lucy Ricardo is on the loose! If she comes to YOUR house without Ethel, do NOT let her in! As for the future of this chair... Shall she be a simple beauty wearing an understated textured fabric for a more modern look or should she stay true to her original colors and be an elegant beauty adorned in plush jewel toned velvet? I'm sharing this post with Tilly's Nest Down Home Blog Hop! You know the old saying, " If you want something done right, let your mother do it!" Oh, wait that's not it. Well, anyway my mom came for a visit over the weekend to get some Grammy love and to gather more inspiration for her flower paintings. I still have an abundance of blooms to spare so we scooted out to the garden where she snipped to her hearts content. Having fresh flowers is a summer ritual she has gotten very used SPOILED to. Just one of the many joys of growing a cut flower garden is being able to share the beauty! It's only early September and much too early for pumpkins if you ask me. If you still have flowers in your garden why not consider bringing a simple back to school bouquet for your child's teacher or child care provider, coach, dance instructor etc. 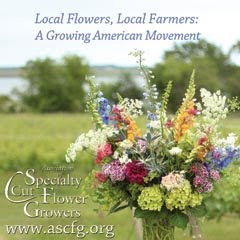 Fresh, local flowers are always a good gift idea! I'm looking forward to incorporating more dried seed pods and faded foliage into my fall arrangements but the cut flower garden is still beaming with bright colors. Now, now, I warned you we'd be in ' house flowers' for a while so no complaining...Ya hear? :) You have my permission to click away right here if you just can't stand another flower photo! Here's a peak at what's still in bloom in the cutting garden! Most of the dahlias I planted get 4-5 feet tall and become very top heavy while in the heavy bloom stage ( which is mid August until the first frost ) I've had to stake them several times each time using something taller and stronger. I started with bamboo stakes, but had to move up to 1x1 wooden stakes. I use natural jute twine to tie them up with.. It's gentle on the stocks and biodegradable. The Zinnia beds are still bursting with blooms too! And the winged visitors have slowed down. This is the only Monarch I've seen in a few days. Mom had plenty to choose from as you can see...! 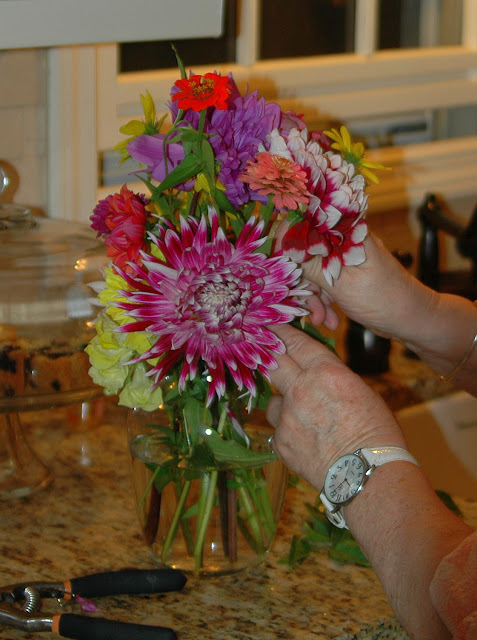 Watching the enjoyment she got while creating her own bouquet gave me a couple of ideas for next years garden. I think I'll open the garden one day a week for a Cut and Carry Bouquet Day! I'm sharing this garden post with Heidi's Country Garden friends!